Remodeling your home? Want to add to the atmosphere and comfort of any room? Get the beauty and heat of a fireplace and the energy efficiency of a zoned heating system anywhere in your home with a decorative heating zero clearance gas fireplace. Interested? Contact us online or call 1-800-888-1045. Read on to learn more about zero clearance fireplaces. Where you can install zero clearance fireplaces. Why it's called a "zero clearance" fireplace. The differences between zero clearance fireplaces and gas fireplace inserts. A zero clearance fireplace's functionality without electricity. Thermostat functionality with zero clearance gas fireplaces. Brands we provide and install. What Rooms Can I Install a Zero Clearance Gas Fireplace? A Sundance Energy decorative heating zero clearance gas fireplace can be installed in any room--even a bathroom, a small den or bedroom. Why is it Called a "Zero Clearance" Fireplace? It's called zero clearance because it's constructed in such a way where it can be safely placed close to (with zero clearance) combustible materials. While zero clearance gas fireplaces can be installed into a wall or framed into a mantel cabinet, a gas fireplace insert is designed to upgrade your existing wood-burning fireplace, improving its efficiency and heat-producing capabilities. In other words, zero clearance gas fireplaces are for homes or rooms where there is no fireplace. Fireplace inserts are only to upgrade an existing wood-burning fireplace. Learn more about decorative heating gas fireplace inserts. Can a Zero Clearance Gas Fireplace Work Without Electricity? Absolutely! Sundance Energy direct vent gas fireplaces can work without electricity because they work via a millivolt valve system. That means you can stay warm and cozy during a winter power failure. Can I Use a Thermostat With My Zero Clearance Gas Fireplace? Yes. Sundance Energy offers many decorative heating gas fireplace models that are compatible with programmable thermostats, giving you energy efficient heat. These thermostats can even be controlled by your smartphone or tablet. Thermostats give you the ability to have the gas fireplace shut off when the room reaches a certain temperature--saving you money and keeping you comfortable, even during power outages. What Brands of Zero Clearance Gas Fireplaces do you Provide and Install? 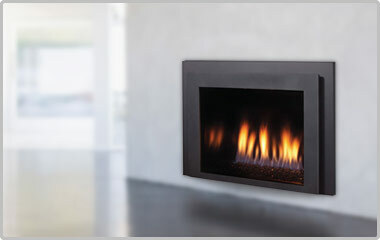 Interested in getting a zero clearance gas fireplace in any room in your home? Contact us online or call 1-800-888-1045.